Yes ! Nigella seeds Tea ! When I first saw this recipe in one of the websites, I was totally amazed at how innovative people could be ....I tried it immediately and believe me it was truly aromatic and refreshing. 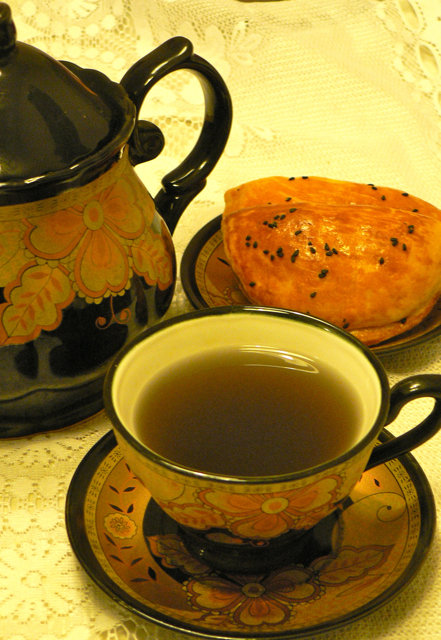 Theres nothing like holding a warm cup of tea and enjoying every sip of it in a cold weather. Above all, with its very high medicinal values , a cup of Nigella seeds tea daily will be highly beneficial for the body. 1. 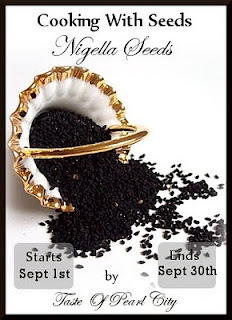 Crush the nigella seeds using a hammer or a mortar and pestle. Please do not powder it finely. You just want them to release the essential oils. 2. Take the boiling water in a tea kettle and put the crushed seeds into it. Cover the kettle and let it rest for 8-10 minutes. 3. Filter out the seeds and discard the contents. 4. Flavor with milk, cream, honey or vanilla as desired. 1. Please do not allow the seeds to steep in the water for a long time, it gives a bitter taste. 2. If you have a teaball, place the crushed seeds in it and the teaball in the cup. After 8 minutes, take out the teaball and serve the tea. looks very good, nice pictures. Very interesting indeed, never heard of it. I had bookmarked a similar tea for the event but never did it :-(. Looks so refreshing !! never heard of this but is very good for health I believe. Very interesting tea, never heard about this..